Bootie LA: ‘90s Mashup Night! 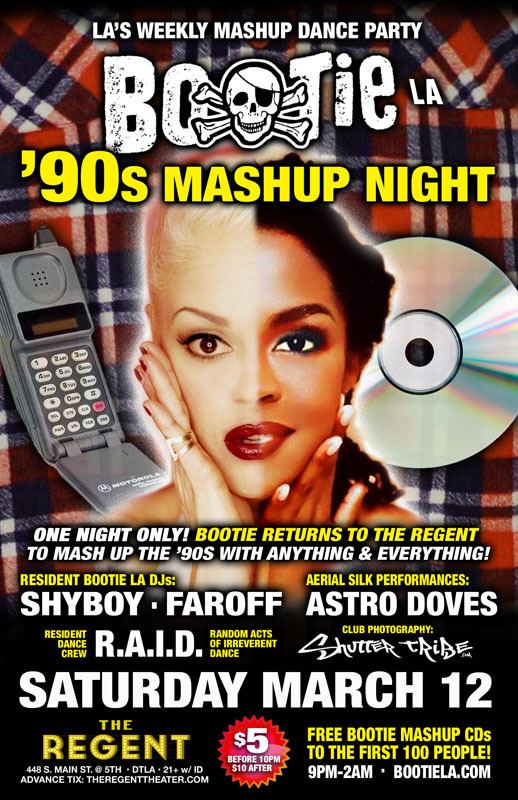 Los Angeles Bootie LA: ‘90s Mashup Night! Bootie LA returns to the Regent to mash up the ‘90s with anything and everything! Bootie LA returns to the Regent for a special night — it’s ’90s Mashup Night! When you think of the ’90s, you realize it was a decade that was musically mixed up. Nirvana or Prodigy? Snoop Dogg or Backstreet Boys? Spice Girls or Alanis Morrisette? Sinead O’Connor or TLC? Well, when Bootie throws a ’90s night, you pick ALL of them … mashed up, of course! Bring your acid-washed wonderfulness, flannel and ripped denim, board shorts, leotard and jeans combos, baggy jeans, and hip-huggers … the ’90s are back for one night! Bootie LA resident DJs ShyBoy and Faroff mix and mash all the ’90s genres with music from multiple decades, paying homage to the era while keeping the music fresh. Astro Doves will present aerial silks performances high above the stage, while R.A.I.D. will be on hand, holding down the stage with ‘90s dance moves and a special Midnight Mashup Show. All this, plus Shutter Tribe snapping all the fun so can remember what you did, and FREE Bootie mashup CDs for the first 100 people through the door!